#sailor of the month – Brian O'Sullivan of Tralee Bay is the Afloat.ie "Sailor of the Month" for June following his clear overall win by more than an hour and forty minutes in the biennial 280-mile Dun Laoghaire to Dingle Race between June 7th and 10th. It was an outstanding month for Irish sailing achievements at home and abroad. 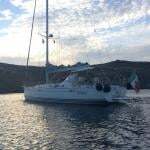 But there was something specially heartening in these difficult times about a skipper from one of our most westerly clubs buying up a 33-year-old cruiser-racer, and showing that with a keen crew, and the right conditions, you can still take on Ireland's best and win. 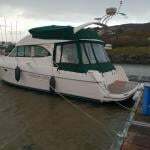 As anyone who followed the ongoing D2D story and subsequent reports on Afloat.ie will be aware, the Oyster 37 Amazing Grace has played an important role in Irish sailing at ports such as Crosshaven, Kinsale and Fenit. Completed by Jim Fagan from a bare hull in a Cork farmyard (though to a standard that belies the tag of "home made"), this classic Holman and Pye design was only bought by Brian O'Sullivan from a fellow member of Tralee Bay SC as recently as the Spring of 2013. But he knew he was getting a good boat with a decent set of sails. The challenge was to fulfill Amazing Grace's potential with a keen crew who could build up their enthusiasm for the big race from Dun Laoghaire, with Tralee providing a small but keen flotilla in the high quality 22-boat fleet. And when conditions feel their way through the race, they were keyed up to finish in the small hours of Monday morning, right in line for a great Kerry victory. The crewing team on Amazing Grace were Finbarr O'Connell, Fergus Kelliher, Pearse Boyland, Tim Kelliher, Cian O'Donnell, Brendan Culloty and Michael McCormack, while the essential shoreside support and encouragement was provided by Frances Clifford. But ultimately, any successful team needs a capable leader, and aboard Amazing Grace they had that in Brian O'Sullivan, Sailor of the Month for June 2013.